For a number of manufacturers, maintain an aseptic method of processing is paramount, particularly pharmaceuticals and food and beverages. Blow fill seal (BFS) technology provides for a contamination-free environment and is adequate for producing as small as 0.1 ml and as large as more than 500 ml liquid filled containers in a rapid manner. The technology of blow-fill seal curtails, if not crosses out, individual intervention, which makes a strong method for the preparation of sterile products. 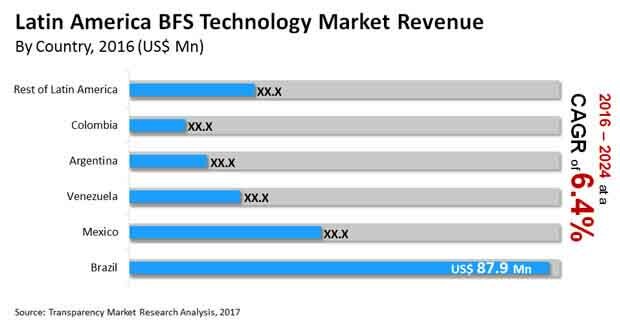 According to a recent business intelligence study by Transparency Market Research (TMR), the Latin America BFS technology market will be worth US$337.8 million by the end of 2024, with the demand projected to increment at a notable CAGR of 6.4% during the forecast period of 2016 to 2024. Sticking to the geographical territory of Latin America, the analyst of the TMR report has detected a highly competitive vendor landscape, which is marked by investments by the major players to improve their production processes and hence cater to greater demands. The report has identified Brevetti Angela S.R.L, Unither Pharmaceuticals, Unipharma, LLC, and Takeda Pharmaceuticals International AG as some of the key companies currently ahead of the curve in the Latin America blow fill seal technology market. The dominant companies are focused on enhancing their production methods to reduce the compilation of non-viable particulate matters. Material-wise, the TMR report segments the market for blow fill seal technology into polypropylene (PP), high density polyethylene (HDPE), low density polyethylene (LDPE), polyethylene (PE), and others such as ethylene vinyl alcohol (EVOH). Product-wise, the market for BFS in the region of Latin America has been bifurcated into 10-50 ml, 1-10 ml, vials, 10-100 ml, ampoules, above 500 m, 100-500 ml, 2-100 ml, bottles, and others. End users studied under this report as cosmetic and personal care product manufacturers, food and beverage industry players, pharmaceutical producers, and others. Country-wise, Brazil has been foreseen to remain the key for the players, promising to provide considerably greater demand than other lucrative countries including Mexico, Argentina, Colombia, and Venezuela. The prosperity of the healthcare industry, and its strong positive reflection on the pharmaceutical industry, is the primary driver of the blog fill seal technology market. Latin America as a region is growing profitably for the healthcare players with increased per capita income of citizens of various emerging economies and uptake for high quality drugs is on the rise. The analyst of the TMR report has noted that nearly 99% of the total demand in the Latin America BFS technology market came from the pharmaceutical industry. In addition to that, the advents advanced technologies such as blow-fill insert seal and co-extrusion are also expected to boost the demand. The food and beverage industry is also expected to add to the demand in the near future. Highly competitive scenario is forcing players to counter each other on the basis of increased production efficiencies and territorial expansion.